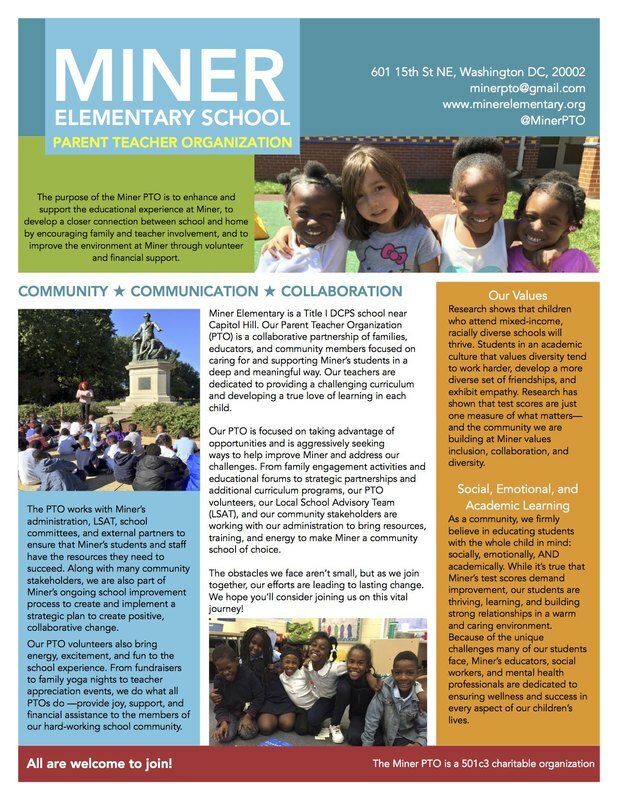 The Miner Parent Teacher Organization (PTO) is comprised of parents, guardians, teachers, and community members working to create opportunities for Miner students and families. It supports parent initiatives and administrative goals through advocacy and fundraising. Every parent or guardian of a Miner student, and every teacher and staff member are automatically a PTO member. The PTO does not charge dues. The Miner PTO is a 501c(3) charitable organization. Contact the Miner PTO at minerpto@gmail.com. ​​The purpose of the Miner PTO is to enhance and support the educational experience at Miner, to develop a closer connection between school and home by encouraging family and teacher involvement, and to improve the environment at Miner through volunteer and financial support. Click here to download a copy of our FY2019 budget. Please join the PTO and let us hear your thoughts and ideas. See also our informational flyer at the right. PTO General Meetings are typically the first Tuesday of each month during the school year, at 6:00 PM, and are always open to everyone. Meeting dates for School Year 2018-2019 are below. Agenda, meeting presentation files, and minutes will be posted prior to, and after the meetings. See the bottom of the page for meeting information for past school years.